The Acts of the Apostles, also called “The Book of Acts” or simply “Acts”, is a historical account of the first 30 years of the Christian church, from the final days of Jesus’ ministry on the earth to about 60 AD. Join the journey to see how God used men and women led by the Holy Spirit to accomplish the unified effort to being the church of Jesus Christ. Become part of the story by understanding the work of the ministry and its ultimate goal of reaching others for Christ. 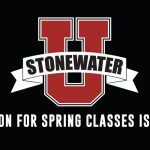 This class is a 12 week class on Tuesdays from 6-8pm. Class begins on February 7th and costs $15.00.